SomethingBlue Studios is a top notch specialty scrapbook shoppe that specializes in scrapbook creations from magnets to calendars and more. Their unique mix of shabby and worn, classic and clean are all sure to please! First, I want to say I ordered something from them about 2 years ago or so, a set of magnets for a birth announcement. I wish I still had the pictures of them because they were STUNNING!!!! From service through to delivery it was one of the best experiences I had had with an online store. So, I can attest firsthand to the quality and service of this store!¬† So whether you need a create gift or something for yourself...stop by...I bet you will like what you see! 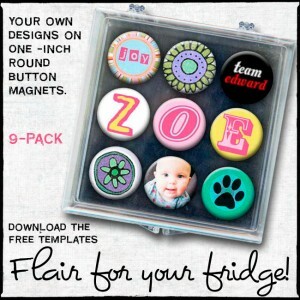 Get these great refrigerator magnets in a case that you can design yourself! Just download the template to create your own or use designs they have done and voila' you have your own custom magnets! I know this is a gift I would love to get! A great product at a great price! Something Blue Studios photo keychain is a double sided keychain that measures approximately 1" and is cast in resin for long time enjoyment! 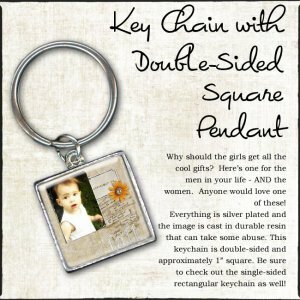 Use their beautifully designed templates or one of your own to create a keychain that will make your friends drool! If you are a digital scrapbooker then this is a shoppe that needs to be on your frequently visited list! Her designs are unique, warm yet fresh! Are you already a customer at Something Blue Studios? Then share your experiences!! !